This is a very stylish offering from a company more usually (but wrongly) considered simply as makers of solid but unexceptional family transport. Photographed in the early 1980s in France during a small gathering of classic cars in a country town, it is the only one of which the photographer took a close-up – which says something for the impression it made. The Simca 8 name was first applied to a small family car made between 1937 and 1951, as a saloon, coupé or cabriolet. The SIMCA (Société Industrielle de Mécanique et de Carrosserie Automobile) company was founded in 1935 by FIAT, when Fiat bought the former Donnet factory in the French town of Nanterre. The first cars produced at the factory under Fiat ownership were Fiat 508 Balillas and Fiat 518 Arditas, but with Simca-Fiat 6CV and 11CV badges. They were followed during 1936 by the Simca Cinq or 5CV, a version of the Fiat Topolino, and the Huit that appeared in 1937 was an 8CV version of the Fiat 508C-1100. Only in 1938 did the cars lose the Fiat name after the Simca. The Simca 8 Sport started life as an elegant cabriolet prototype with a Pinin Farina body at the 1948 Paris Salon. The Head of Simca, Henri-Théodore Pigozzi, liked it so much that he decided to produce it – in open and fixed-head coupé forms. His enthusiasm was understandable: the design was very similar to those seen on certain examples of Cisitalia and Ferrari 166 Inter. The car was built not by Simca but by Facel-Métallon (of Facel-Véga fame), in a complicated process with pressings made at Amboise, assembly at Colombes and final preparation at Dreux. The coupé did well in the 1950 Monte Carlo Rally, with the cars finishing 4th and 5th overall and winning the 1.5-litre class. The car in our picture is a rare beast. It is the version commonly referred to, at least in America where it was favoured by the Hollywood movie crowd, as the 3-bar coupe after its distinctive 3-chrome-bar horizontal grille. 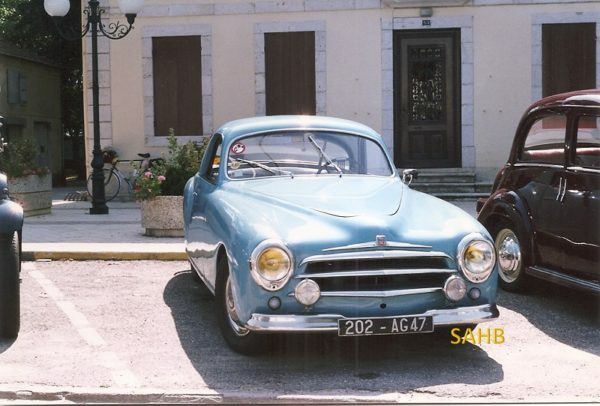 It is the final version of the Simca 8 Sport, with a modified front based on the Aronde that replaced the 8 in 1951, but still with the separate chassis of the 8. By late 1952, the Sport was built on the new monocoque chassis of the Aronde and only offered as a two-seater hardtop coupé, it being impossible to achieve enough rigidity for a cabriolet. The Facel-bodied Simca Sport lived on until 1962 in different styles, and was always an expensive model at the top of the Simca range. The owner of our example therefore had every right to display it proudly on that sunny day in France all those years ago. Coys will be offering a 1950 Cabriolet version with the slightly different front grille at their Monaco auction next Friday. Estimate is 55K – 70K Euros . . .